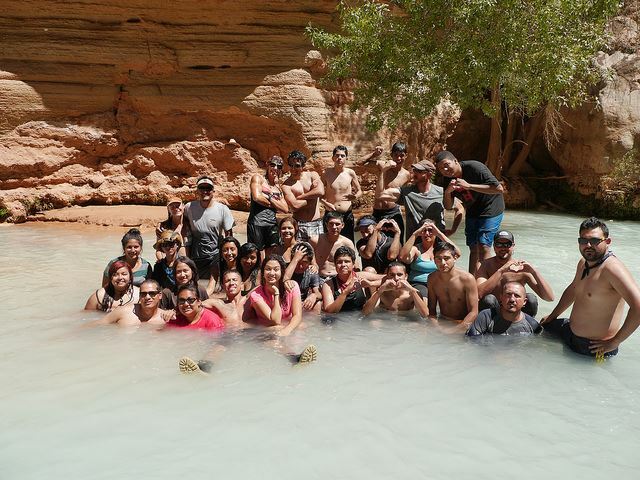 LatinaLista — A couple of weeks ago, a group of Latino students from states who depend on the Colorado River for their drinking water were taken on a 6-day rafting trip down the river and through the Grand Canyon. It wasn’t just for fun. The young people from Arizona, Colorado and Nevada were part of an excursion organized by Nuestro Rio, an environmental advocacy organization dedicated to educating Latinos about the historical ties between Latinos and the Colorado River Basin and the importance of safeguarding the river for the future. The students were given a dire warning — within their lifetime, the Colorado River will no longer be able to satisfy demand. There’s a better than 50 percent chance of an official water shortage being declared in 2016 for the Lower Colorado River Basin as a result of the drought that has gripped the river’s watershed for the last 14 years. In organizing the summer trip, for whom many of the students it was their first time to go rafting or step foot into the Colorado River, Nuestro Rio officials wanted to introduce the next generation about a life-changing crisis that will squarely hit their families, neighborhoods, communities, cities and states. “Before I spent six days living and learning on the Colorado River, I didn’t think much about the river and I assumed it would always be there. Now I understand that we have to take steps to save the Colorado River right now, today – or it will be gone,” said Rocsana Contreras, a Nuestro Rio youth leader from Las Vegas. The group of students traveled to Washington the first week of October (2013) to meet with congressional lawmakers and share their experiences and the lessons they learned on the Colorado River. They met with U.S. Department of the Interior Secretary Sally Jewell and partnered with western local elected officials in launching Nuestro Río’s new Regional Water Caucus at the Congressional Hispanic Caucus Institute conference. These students get it and they understand the urgency of the crisis. Now, they only have to convince the adults of the same. The featured video chronicles the students’ trip and what impacted them the most.